This month at Redeemer, the children at Vacation Bible School will be learning to “Shine!” This year’s VBS theme seems particularly relevant to even the adults at our church. Our mission statement is “to be a lighthouse to our community and the world.” And, what do lighthouses do? … They shine! I firmly believe that if people are going to see the light of Christ in the world today, it is going to be through His people, sharing His Love and His Word! After all, we are to be shining like a city on a hill, right? (Matthew 5:14). In Philippians chapter 2, we are encouraged to stand out among those in a warped and crooked generation. When we live by the light of God’s Word, we do look different than the world – we stand out! And just like the Psalmist exclaims, “The heavens declare the glory of God; the skies proclaim the work of his hands.” (Psalm 19:1) So we glorify God when we shine like stars in the sky. It may be difficult for us to see it in our sin-sick world, but we are already bearers of that light and glory of God now! One day that light will be visible for all to see – No one will be able to deny the Light of God nor the Glory of Christ our King when He returns! But for now, that glory is visible to us through the eyes of faith. And our faith directs us to Scripture to see the ways in which the Glory of Christ is present with us now, but will be more fully revealed at Christ’s second coming. 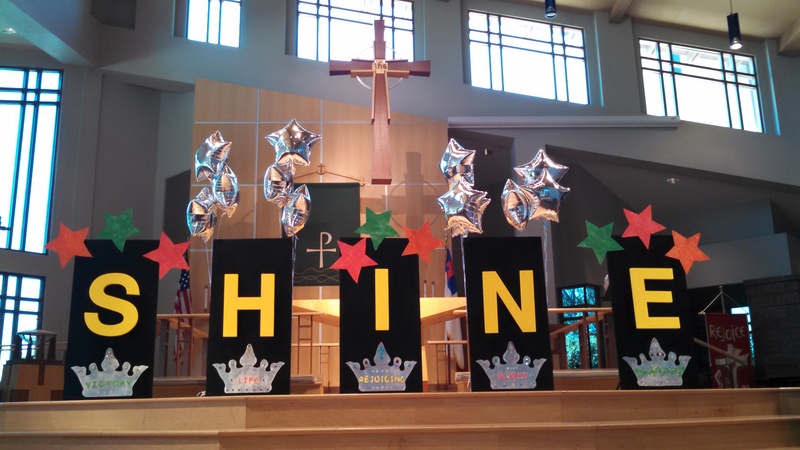 The VBS curriculum captures these images of glory in terms of five “crowns” that are in store for Christians. Can you see how we already possess these in Christ? 1. The Crown of VICTORY – Just as an athlete in the Olympic Games would get a wreath (crown) placed on their heads when they were victorious, so do Christians receive a crown of glory after we have completed the course that the Lord has prepared for us. (1 Corinthians 9:25) And yet, we are already victorious in Christ – because He has defeated the enemy for us! 3. The Crown of REJOICING – Oh how believers in Jesus will rejoice when He returns in glory! (1 Thessalonians 2:19-20). And yet, those of us who know the Lord, rejoice in Him now (Philippians 4:4). Part of what it means to have the Holy Spirit in us through faith and baptism, means that we already bear the spiritual fruit of joy now (Galatians 5:22). 4. The Crown of GLORY – Many believers today are despised for their faith, and even persecuted. When Jesus gave the Sermon on the Mount, He encouraged His hearers by reminding them that the meek will one day be glorified in God’s presence. The Apostle Peter echoes this when he says “you will receive the crown of glory that will never fade” (1 Peter 5:4). And yet, even now we bring God glory when we honor and worship Him. 5. The Crown of RIGHTEOUSNESS – We await the consummation and perfection of our righteousness – a time when we will no longer sin. The Bible refers to this as a crown to be awarded to us when Christ returns (2 Timothy 4:8). And yet, even now in Christ, we have become the righteousness of God (2 Corinthians 5:21). Please join me in rejoicing that these crowns are ours in Christ! May the knowledge of who we are in Christ allow us to shine brightly for all to see – and in so doing, may we proclaim God’s glory.